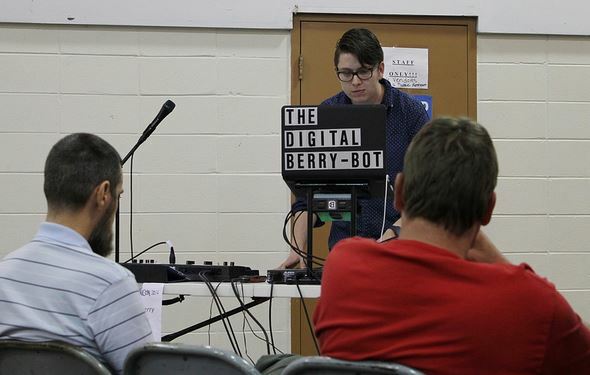 Cameron Eckelberry, aka The Digital Berry-Bot, joined us last year at Gulf Coast MakerCon and gave us a real earful – literally! He shared a bit about what he does and why he does it here. You can also see his interview with PLuGHiTz Live below. As you can see, Cameron is a man of few words but his music speaks volumes! CE: My name is Cameron Eckelberry, I make all manner of Electronic Music. CE: It’s fun, I love creating things and electronic music is my favorite medium to communicate. CE: I’m bringing my live set! I’ll be remixing my songs live for everyone’s enjoyment! It’s a lot of fun and you never know what to expect as every live set is different. CE: Gulf Coast MakerCon is a really cool place. It’s awesome to meet people who are out there creating our future. There are tons of smart and inspiring people there. We think you’re one of them, Cameron! Thanks for bringing your music and energy to Gulf Coast MakerCon 2015! This entry was posted in Gulf Coast MakerCon, Gulf Coast Makers Festival, Makers, Music and tagged Cameron Eckelberry, Digital Berry Bot, electronic music, Gulf Coast MakerCon, Gulf Coast Makers Festival, MakerCon, makers festival. Bookmark the permalink.